The Dienes PQAS 3/8 knife holder is offered by Dienes with the same quality and ruggedness you have come to expect from 100 years of Dienes ingenuity. This design employs the same mounting dimensions as all of the Dienes PQAS style holders and can be interchanged on the same dovetail bars. These holders come standard with the same pneumatic connections Dienes offers on all PQAS style holders. Both holders are able to produce 55 pounds of force when 90 PSI is applied to the holder. These holders are rated to run up to web speeds of 950 feet per minute. Dienes is happy to offer our customers slitting solution to the highest speeds and the narrowest slit widths in the converting industry. 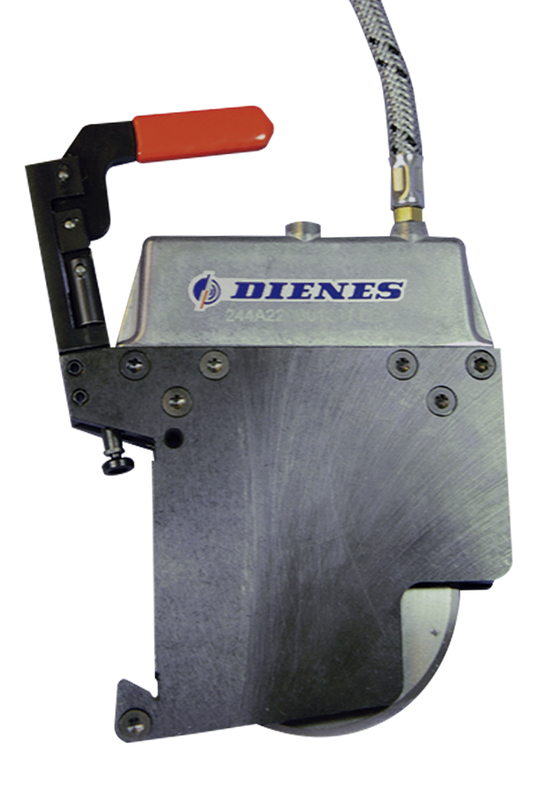 The Dienes PQAS 3/8 holder is capable of slitting down to 3/8 inch (.375 inches) slit widths whether slitting paper, film, foils or tapes. When you are looking for slitting know how, call Dienes.